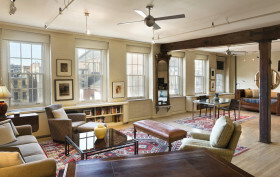 There’s a new loft available in one of Soho’s most prized co-ops. 140 Thompson Street, otherwise known as the West Broadway Arches, is a beautiful early 20th century brick building with large arched windows, right on the cusp of Soho and Greenwich Village. In addition to its great location, this flexible one-bedroom unit has every detail a prospective buyer could want in a quintessential loft, all for $1.95 million.